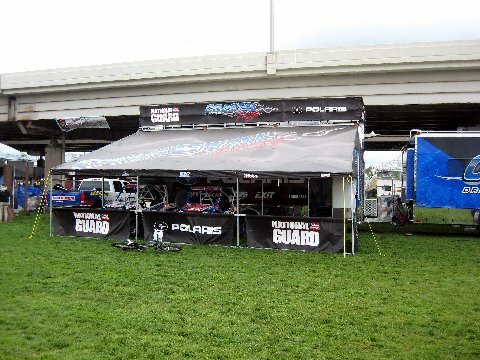 The National Guard Polaris Coastal Drilling Yokley Racing Team hauler traveled to Louisville Kentucky for the annual Thunder over Louisville on April 16. This one day event features the largest annual fireworks show in the country, kicking off the festivities leading up to the KY Derby on the first Saturday in May. Unusually volatile spring weather in the region made less than perfect weather conditions for the event. Intermittent rain, cool temps and windy conditions kept the attendance less than normal. However, 300,000 people attended and witnessed a great air show featuring 90 military and other aircraft, including the latest $150 million F-22 Raptor fighter jet. 58,000 shells were exploded for the grand finale 30 minute fireworks display. 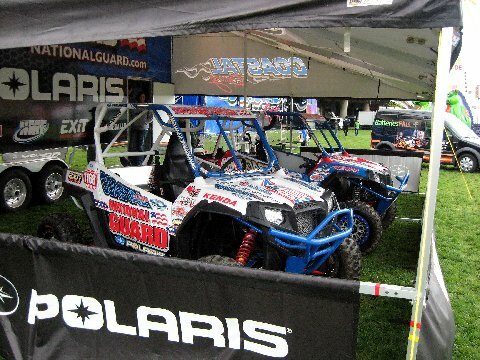 The 85 foot Polaris Coastal hauler and Polaris RZR XP race machines were the showcase display in the National Guard space. The hauler provided a great place for the National Guard recruiters to get out of the cold, wet conditions and talk to interested potential recruits. National Guard Team racers William Yokley and Jarrod McClure worked the display all day to interact with the crowd. The display area was located on the Louisville riverfront’s Great Lawn, and featured presentations by all branches of the military, UPS, Ford Motor Co, Meiers, McDonalds Corp and many other companies. The static display of the Army Apache attack helicopter is always a crowd favorite. The National Guard Polaris Coastal Yokley Racing Team headed to California the next morning for the next race in Anza California on April 23. Attached are a few photos taken early Saturday morning before the scheduled opening as the team was setting up their display. A big thanks goes out to all our sponsors who enable us to participate in these type events! See you at the races.